‘What’s up with you today?’ he asked. He could hardly have chosen a worse formula. The question has on most people precisely the same effect as that which the query, ‘Do you know where you lost it?’ has on one who is engaged in looking for mislaid property. ‘Nothing,’ said Reade. Probably at the same moment hundreds of other people were making the same reply, in the same tone of voice, to the same question. More often it is Wodehouse who distracts me. I pick up The Mating Season or Pigs Have Wings, or possibly Mulliner Nights, in search of a quotation and end up reading the whole thing. Life goes on, time passes, until one day I begin with The Pothunters all over again. Fortunately, it’s a dashed enjoyable book. I picked it up yesterday in an odd sort of mood. Life has been a bit of strain lately and I’ve been identifying with the aforementioned Marvin more than ever. Is it any wonder that I have these odd moods? There is plenty to be gained from analysing Wodehouse. Why does his writing make us happy? What is is about his world and characters that appeal to us? Are there lessons we can take from his writing to make the world a better place? What can emerging writers learn from Wodehouse — so that his legacy extends to include future generations of writers who bring sunshine into our souls? It’s all part of the Plumtopian vision — to inhabit a world where the healing balm of Wodehouse is liberally applied. She melted quite perceptibly. She did not cease to look like a basilisk, but she began to look like a basilisk who has had a good lunch. I’ve never actually tried to read all of Wodehouse, though I believe I do have them all as e-books. The size of the task daunts me … 94 books! I’m not entirely certain how many of them I actually have read, either … especially with the Blandings and Jeeves series, they tend to blur together a bit over the years (and I’ve been reading PGW for over 40 years). What Ho! What Ho! I think the Plumtopians featured in the sidebar may rotate so if you pop off at some point, don’t be offended? You are definitely in the list. I doubt I will ever complete the project of re-reading Wodehouse in order. Not unless I write a best seller myself, and manage to fund early retirement. What a curse it is for we readers/writers who rely on our day-jobs. I should be writing my own fiction now too — I won’t tell anyone if you don’t. I’m perfectly content to be rotated 🙂 And I have actually got some writing in now! Well done! I have just legged it to the local cafe as I wasn’t getting any writing done at home. The other Glossops seem incapable of making the simplest move without consulting me. I must be disciplined and use the time now. It sure is. Thanks so much. I don’t think this kind of elitism is as bad as it once was, and there are happily some excellent people who are helping to change that perception. Like your good self! I have been re-reading Service with a Smile. I am curious to Know if Lord Emsworth has got himself involved to be a Freemason at one point? Good question. Not to my knowledge though. You may be right. I know very little about Freemasons so if there is a joke in there, I am likely to have missed it. I wonder if anyone else has spotted it? Undoubtedly his writing is like a soothing balm for frayed nerves. Other than perfect linguistic skills, I think he presents steel-like nuggets of wisdom of life in velvet-cushioned humour. Therein lies his greatness. I like the natty way you put that, Ashokbhatia! Seems to me that calling perfection sunlit is already to analyze it. I loved the Marvin references..one of my favourite characters from the Galaxy series! Definitely! He’s a great character — a touch of the dyspeptic poet about him. Oddly enough, I’ve been thinking on the same lines recently – I’ve just finished a post analysing the Wodehouse interview and what us would-be authors can learn from him over at http://www.moulderslane.wordpress.com. I think if more people wrote books the Wodehouse way, the world would be a far better place than it currently is. Another good PR interview that delves into a master’s writing process is that with John McPhee. I could not agree with you more. I loved your piece. Thank you so much for your lovely comments and for re-blogging! Your stuff is all so readable and well considered. It won’t be long until you are firmly established in the blogging world. The trick then, is to keep the stuff coming. I find a good piece takes time — anything from a full day to several weeks. Very occasionally I decide to write something brief, just so people know I’m still alive, but when I sit down to write it, it develops into something more. I’m currently aiming to produce an average of one post week. The most prolific bloggers work more quickly, and produce content more often than this, but my blog is not linked to topical content or trying to generate sales, so think a weekly post is reasonable. Occasionally, when life intervenes, I post less frequently. Some of my favourite bloggers might not post for several months, but are always worth reading when they do. Whatever rhythm works for you, I am going to enjoy following you. Thank you *so much* for this encouragement! You are absolutely right in what you say about needing to keep posting I have several ideas on file and half-written pieces, but, as you say, a good piece takes time, and things are a little hectic here. A post a week sounds pretty impressive, given your other commitments. I have a weekly post at my business blog (a horticultural nursery) but I’ve held back the April ones because I noticed that the tone had descended into reportage and lost the energy and enthusiasm of the first few months, and I need to rewrite them. I feel that I’m starting to get to grips with my occasional/opinion pieces at Moulders Lane but I’m really struggling to find time to write posts for my Warrington blog. Again, I have several half-written pieces on file and no shortage of ideas but, as its factual, even the briefest pieces require a lot of research. I’m getting slightly more of a feel for what blogging’s all about though (and more and more respect for bloggers!) and I really admire your discipline in the way you approach it. It’s inspiring me to look at possible ways of re-organising my own day – and hopefully become as productive as you! Nice, strategic thinking. I’m afraid I’d associate with anyone when it comes to be published. Although I at least have the decency to be ashamed of this fact. I will have a closer look at the Toast. Curious: will you publish under your nom de plum? Publishing is a long way off. Need to actually finish something. I will definitely finish and post the Wodehouse short story to the blog though. Oh, how sad. I thought someone wanted to buy a book I hadn’t yet written. Nice pun though. So sweet of you to say so. If I never get one finished, I’ll send you something unpublished to amuse you. It’s a deal. I’m not literary critic. I just like good writing, which is why I’m here. Sounds like dangerously near Beverley Nichols’ attitude! 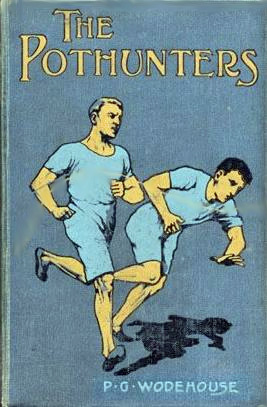 I’ve just discovered that a lot of Wodehouse’s early work Is available at Project Gutenberg (http://www.gutenberg.org/ebooks/search?query=P+gWodehouse). It’s interesting to see how his style develops – I knew he’d reworked ‘Love Among the Chickens’ from the original 1906 version which he considered bad work later on, but there’s also a not very good one called ‘Betty and the Prince’ (1912) from which he’s lifted the central portion and reworked it into ‘Psmith, Journalist’ (1915). ‘BatP’ bears the hallmarks of having been written originally as an American magazine serial and it’s interesting to see that even Wodehouse struggled a little with finding the right tone in the early stages of his career. I’d recommend referring to the historical money converter Measuring Worth (http://measuringworth.com) when reading them; it adds a lot to your sense of the period. I think you (or perhaps someone else) directed me to currency conversion site previously. Fascinating, especially when you realise his school boys were throwing around comparatively substantial amounts. The early works have been online for some years, which was wonderful back on the days before the Everyman reprintings, as some were notoriously hard to find. Although I generally prefer to read them in book form, I love being able to use the search function when there is something particular I am looking for, and can’t find. I moved to an ipad earlier in the year, which makes writing on the bus easier, but other things I used to do (like use WordPress) lamentably more difficult. I have not discovered how to find text in ebooks on the ipad. Anyway, must dash like mad now as I am really late. Given the choice, I’d far rather have a book; but it’s great to be able to read stories online you’ve not been able to find in the shops, or have no money for. I use free online books the same way I used to use the library – to discover authors whose books you definitely want to buy, or whose books you’d like to read but wouldn’t necessarily buy to keep. I was given an iPad for my birthday last year and am now a complete Apple convert. Not only is it a dream to use but it’s incredibly beautiful as an object. I have so many problems with my clunky laptop – I’m putting in for a MacBook this year (if only!). I like the ipad in many ways. I think my issues are partly because the ipad versions /Apps for sites I use are not as functional as the ‘normal’ web page. WordPress is a good example. Viewing and commenting are more cumbersome, so I find I put these things off until the weekend, when I can sit at a desktop. Writing on the ipad is also more difficult in some ways, but that suits me, because I concentrate on what I am writing, without the distractions of formatting etc. Those things are all sorted on the weekend when I collate the work I’ve done during the week’s commuting. So it is actually a really good tool to ensure I focus on creating a first draft. I am getting there — about half way finished with the Wodehouse story, and excited about sharing it with you. The portability of the ipad makes it indispensable for the aspiring writer with a day-job and a longish commute. I’m getting more and more of an impression of you as an admirably disciplined person! As a touch-typist, I find it very difficult to use the iPad for anything lengthy and much prefer using a right angled screen and keys for ‘proper work’, which is why I stick with this old laptop despite its manifest problems. Portability in travelling situations is a huge plus though – I think the IPad will become as indispensable as the mobile phone soon, with laptops relegated to the home or hotel room for the worker/writer and pcs only used in larger offices.